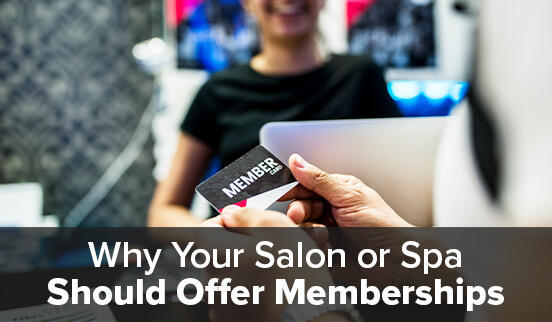 Does your salon or spa offer memberships yet? If not, consider that such programs, if done correctly, can increase the frequency of client visits, help bolster your client loyalty and retention rate, boost your team’s productivity, and drive sales – all great ways of improving your bottom line. These days, clients have an abundance of options available for the services that they seek. That means that salons and spas need to step up their game with more and unique offerings to meet growing client expectations. With a membership program, your customers can receive more valued services for less money, which they tend to appreciate. The beauty of membership programs is that they can foster client loyalty and keep them coming back for more. Memberships are also more likely to encourage your clients to visit your salon or spa more often than they usually would. And, for every interaction that you have with your client, you have the opportunity to pre-book for another visit, sell retail, up-sell, and suggest add-on services. Even better, memberships guarantee repeating revenue. Who doesn’t want that? So, for every $100 monthly membership that you sell, that’s $1200 that goes to your business for the year, guaranteed. Yes, it will take a little bit of work to manage the logistics, but when thought through carefully, a robust membership model can work to alleviate slow days, fill in loosely booked schedules, and even help launch new talent. The best advice with a membership program is first to determine what services you can offer multiple times each month at a flat rate with minimal expense. If you are a salon owner, it would need to be something that most any service provider could offer. Massages and blowouts are excellent services to offer as part of a membership, as these are typically highly valued by clients and have a minimal expense. Think through how many times a month a client would likely visit your salon for a blowout or your spa for a massage. Use these figures to determine a realistic price for the monthly membership; just be sure that the rate still allows some revenue for your business. It won’t yield as much as a single, one-time service, but the amount still needs to be enough to make it worth your while. And if you are not sure what to ask price-wise, find out what your competition is doing and try to meet, if not beat, it. Here’s the kicker – offer something above and beyond your competition to make your membership stand out. Consider a free travel-size hairspray or an add-on service like a conditioning treatment for salons or a hand massage for spas; maybe even additional points towards your salon or spa rewards system. The options are pretty much unlimited. Just make sure that you are not giving too much away. Salon memberships need to be a good value for your clients but should still offer some level of income to you and your staff. To learn more about different types of membership programs, click here.